Charles Louis Brown was born on 22 August 1936, in Gaston, North Carolina USA, to Lyla Brown, a housekeeper, and Albert Louis Moody, a United States Marine. He was a guitarist, bandleader and singer, best known as “The Godfather of Go-Go”. He passed away in 2012. 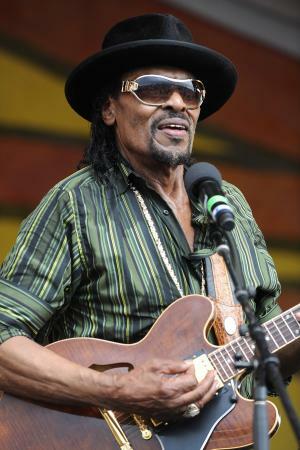 So just how rich was Chuck Brown? According to sources, Brown had earned a net worth of over $200,000, mostly accumulated during his music career which began in the early 1960s. Brown grew up in poverty, raised by his mother; he never knew his father. When he was six years old, they moved to Washington, D.C.; he eventually dropped out of school, taking several jobs, such as digging ditches, shining shoes and selling newspapers, but by the age of 15 he was living on the streets. Not long after, he joined the US Marines, but only served 11 months, after which he started to live the life of a petty criminal, and was imprisoned several times for robbery and selling stolen property. Then, in the early ’50, he shot a man in what he called self-defense, and was convicted to spend eight years in Lorton Correctional Complex. Here he bought his first guitar. Upon leaving Lorton in the late ’50s, he returned to Washington, D.C., where he landed jobs as a tractor trailer driver, bricklayer, and a sparring partner at boxing gyms. He also occasionally performed at local parties. In the early ’60s, Brown began playing guitar with Jerry Butler and The Earls of Rhythm, then in 1964 he joined the band Los Latinos. Two years later he formed his own group, the Soul Searchers, which later became known as Chuck Brown and the Soul Searchers. Around this time, Brown started to develop his own unique sound, that would eventually become known as Go-Go, a sub-genre of funk music, and Brown became a local legend known as the ‘Godfather of Go-Go’. In 1972 he released his debut album called “We the People”, with the same-titled song becoming an instant hit that drew him much needed attention. His net worth began to grow. He released his second album in 1974 – “Salt of the Earth” – which spawned the hit singles “Blow Your Whistle” and “Ashley’s Roach Clip”. His third album, “Bustin’ Loose”, came out in 1979, with the same-named song spending four weeks atop the R&B singles chart. Brown’s 1984 song entitled “We Need Some Money” followed by the live album “Go Go Swing” boosted his popularity too, giving Go-Go music an international following. His music became so powerful that many other artists began incorporating Brown’s sound into their own, all of which contributed to his wealth. In the ’90s he met at the time an undiscovered talent named Eva Cassidy, and went on to record an album with her – the 1995 “The Other Side” – a critically acclaimed mix of jazz and blues duets. After Cassidy died of cancer the following year, Brown dedicated his next album to her, his 1998 “Timeless”. The early part of the 2000s saw the singer releasing some new live material, as well as a studio album, the 2007 “We’re About the Business”, reaching #1 as independent album and #2 as R&B album on Billboard, significantly improving Brown’s wealth. In 2010 he released a new album called “We Got This”, which contained the Grammy nominated song “Love”, a collaboration with bassist Marcus Miller and singer Jill Scott. Brown’s last album was released posthumously in 2014. When it comes to his private life, Brown was apparently married a number of times and had several children; sources are unaware of the identity of them all, except that he was married to Jocelyn from 1992 until his death from multiple organ failure in 2012, in Baltimore, Maryland. 1 Father of Nekos Brown, and Wiley Brown. Driver: Parallel Lines 2006 Video Game performer: "Bustin Loose"
The Real Cancun 2003 Documentary writer: "Hot in Herre"
Head of State 2003 writer: "Hot in Herre"
Agent Cody Banks 2003 writer: "Hot in Herre"
Crackers 1984 performer: "Berro e Sombaro" / writer: "Berro e Sombaro"
Doctor Detroit 1983 performer: "Bustin' Loose"
Wattstax 1973 Documentary writer: "We The People"